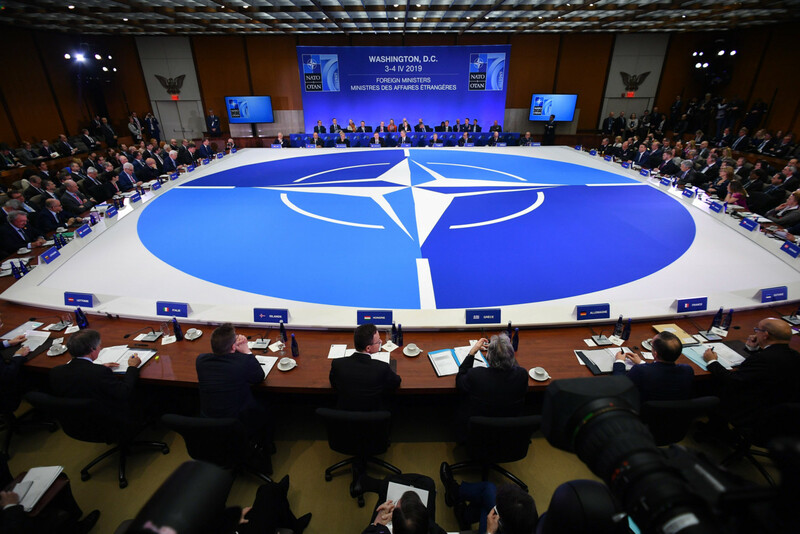 The North Atlantic Treaty Organisation (Nato) concluded on Friday a landmark summit of foreign ministers in Washington on the 70th anniversary of its founding charter being signed. Despite the Trump team’s continuing concerns about the military alliance, its big birthday week has bolstered, significantly, its US support base. Secretary-General Jens Stoltenberg was buoyed by bipartisan US acclaim on Wednesday in a joint address to Congress which saw a stirring defence of the alliance. Legislators gave several standing ovations in a pointed rebuke to President Donald Trump who threatened last year to pull out of the organisation. This congressional success was striking after a White House meeting of mixed signals with Trump on Tuesday. While the president has been relatively quiet about Nato in recent months, few have forgotten the extraordinary scenes last year when he put the alliance’s annual summit in disarray. His antics, coming so swiftly after the previous month’s G7 debacle in Canada, underlined the growing tensions within the West under his presidency. Trump’s behaviour then confirmed pre-summit anxiety and led to cancellations of a series of press conferences and bilateral meetings. What had been particularly feared, as indeed happened, was that he would criticise Nato colleagues, and then go on in the days that followed to have a cordial meeting with Russian President Vladimir Putin in Helsinki, undermining confidence in the transatlantic alliance. Last week’s charm offensive from Stoltenberg, which also saw Nato move its annual summit of foreign ministers from Brussels to Washington, has underlined the continuing relevance to US decision-makers of the organisation with a collective population of around one billion. For all its weaknesses, Nato remains one of the world’s most successful ever military alliances, and has helped underpin the longest period of sustained peace in the West’s modern history. Stoltenberg stressed to US decision-makers how the alliance is reforming to meet new challenges and opportunities as it recalibrates strategic direction in a rapidly changing security environment. At last year’s summit, for instance, modernisation measures announced included launching a new training mission in Iraq, and extending funding for the Afghan military, underpinned by a new military command structure, and increased force readiness. Looking ahead to the 2020s and beyond, one of the key areas that the Trump team is reportedly encouraging Nato to address is potential security threats from China. What is perceived as Beijing’s growing global assertiveness is a rising concern in Washington, and numerous Trump officials see the nation as a near-peer competitor. As well as focusing on the new, the old (Russia) was a key topic last week, especially around Ukraine. Following Moscow’s annexation of Crimea, and the wider destabilisation of Ukraine, Nato’s relationship with Russia is at one of its lowest points since the end of the Cold War. And there remains alarm in certain quarters about the West’s capability to respond to what is perceived as a significantly enhanced Russian security threat. Whereas Russia is estimated to have increased defence spending by some 80 per cent between 2008 and 2014, the counterpart figure for Nato countries collectively was a decrease of around 20 per cent, although there have been some increases in defence spending since then in numerous European states, and Canada, and a significant rise in the United States. This burden sharing issue, which Trump has seized upon, has long been a sore spot for the United States, which accounts for around two-thirds of total Nato defence spending. For instance, Barack Obama had previously urged allies during his own presidency to meet the 2 per cent of GDP spending targets on defence. Numerous Nato states — before last year’s summit — have been pushing ahead with increases in defence spending, including a cross section of the EU-28 under a new European Defence Action Plan, approved last year, that advocates greater military cooperation between the union. Here it is a combination of Russian military assertiveness, instability in the Middle East and Africa, not just Trump’s apparently uncertain commitment to Europe’s security, that has driven this spending move. One of the key areas of Nato activity which Trump appears to wholeheartedly approve of is the so-called campaign against terrorism. As a presidential candidate in 2016, he asserted that the alliance “is going to have to be either readjusted to take care of terrorism or we’re going to have to set up a new coalition, a new group of countries to handle terrorism because it is out of control”.Trump was therefore pleased with the announcements about Afghanistan and Iraq last year. These build on measures in 2017 that allow Nato to assume a stronger status in tackling terrorism in the Middle East. Taken overall, last week’s Nato charm offensive was an attempted antidote to last year’s summit which saw Trump’s disruptive diplomacy in full force. Stoltenberg is well aware that Trump, who could yet be re-elected in 2020 for four more years, appears to have significant continued concerns about the whether the alliance is fit for purpose as it moves into its eighth decade.